Alaska is a state of the United States in the northwest extremity of the North American continent. According to the 2010 United States Census, Alaska is the 3rd least populous state with 710,231 inhabitants but is the largest by land area spanning 570,640.95 square miles (1,477,953.3 km2). Alaska is divided administratively into 19 organized boroughs and one Unorganized Borough (which is divided into 10 non-administrative census areas) and contains 149 incorporated cities: four unified home rule municipalities, which are considered both boroughs and cities; ten home rule cities; nineteen first class cities; and 116 second class cities. 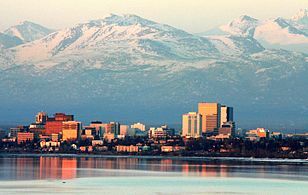 Alaska's incorporated cities cover only 2.1% of the territory's land mass but are home to 69.92% of its population. The majority of the incorporated land mass consists of the four unified municipalities, each over 1,700 square miles (4,400 km2) in size. Only two other cities have an incorporated area exceeding 100 square miles (260 km2): Unalaska, which includes the fishing port of Dutch Harbor, and Valdez, which includes the terminus of the Trans-Alaska Pipeline System. ^ The Borough seat is Healy, a census-designated place. ^ Edna Bay incorporated in October 2014 and thus not included in the sums for the 2010 or 2000 censuses. ^ The Borough seat is Petersburg, a census-designated place. ^ The Borough seat is King Salmon, a census-designated place, and is located in neighboring Bristol Bay Borough. ^ A conflict as to the date exists between sources: 1996 Alaska Municipal Officials Directory (p. 136) gives 1977, while "Directory of Borough and City Officials 1974" (p. 72) gives December 23, 1963. It is unclear whether Selawik may have dissolved and later reincorporated its city government. ^ a b c d e f g h i "GCT-PH1 — Population, Housing Units, Area, and Density: 2010 — State – Place and (in selected states) County Subdivision". 2010 United States Census. United States Census Bureau. Retrieved June 17, 2015. ^ 2015 Alaska Municipal Officials Directory. Juneau: Alaska Municipal League. 2015. p. ix. ^ "Municipal Government Structure in Alaska". Local Government On-Line, Division of Community and Regional Affairs, Alaska Department of Commerce, Community and Economic Development. September 15, 2003. Archived from the original on September 13, 2008. Retrieved July 16, 2008. ^ "Local Government In Alaska" (PDF). Alaska Department of Commerce, Community and Economic Development. February 2001. Archived from the original ( PDF) on July 18, 2008. Retrieved July 16, 2008. ^ a b "Directory of Borough and City Officials 1974". Alaska Local Government. Juneau. XIII (2): 45. January 1974. ^ a b c Denning, Angela. "Whale Pass voters approve incorporation | KFSK". Retrieved 2017-01-10. ^ "Alaska Taxable 2011: Municipal Taxation - Rates and Policies" (PDF). Division of Community and Regional Affairs, Alaska Department of Commerce, Community and Economic Development. January 2012. Archived from the original ( PDF) on April 25, 2013. Retrieved January 23, 2013. ^ "Background on Boroughs in Alaska" ( PDF). Local Boundary Commission, Division of Community and Regional Affairs, Alaska Department of Commerce, Community and Economic Development. November 2000. Retrieved July 16, 2008. ^ Bell, Susan (September 10, 2014). "Edna Bay Incorporates as Alaska's Newest City" (PDF) (Press release). Juneau, Alaska: Commissioner's Office. Department of Commerce, Community, and Economic Development, Division of Community and Regional Affairs. Retrieved May 21, 2016. ^ 1996 Alaska Municipal Officials Directory. 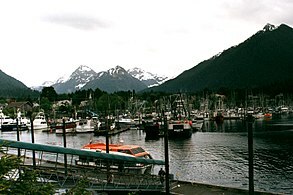 Juneau: Alaska Municipal League/ Alaska Department of Community and Regional Affairs. January 1996. p. 55. ^ "Soldotna home-rule charter passes". Peninsula Clarion. Morris Publishing Group, LLC. Retrieved 20 September 2018. ^ Lagoudakis, Cindi; Menish-Meucci, Marilyn. "Fact Sheet". petersburgak.org. Petersburg Chamber of Commerce/Visitor Information Center. Retrieved June 23, 2018.